While EU and US negotiators are meeting this week in Washington, business groups and civil society organisations have released contradictory statements about regulatory cooperation in the Transatlantic Trade and Investment Partnership. Businesses on both sides of the Atlantic want coordination between regulators to be hardwired into the deal to remove barriers to trade. But 33 NGOs signed a joint declaration of their “deep concern and firm opposition” to such cooperation on rules, arguing it will drive down standards in areas such as chemicals, food standards and financial services. “It cannot be about lowering standards, but about avoiding extra costs – the costs entailed for example in the duplication of factory inspections and unnecessary divergences of approach,” she said on 30 September. “As a doctor, I will say no to any attempt to lower EU standards. One cannot compromise on that. These standards shall not be sacrificed for free trade. The high EU standards have also facilitated our global exports,” Vytenis Andriukaitis, candidate for health Commissioner, said the same day. The contrasting positions highlight the deep divisions in the EU over the proposed free trade agreement, as negotiators conduct the seventh round of talks in Washington this week. The NGOs, including FinanceWatch, War on Want, and Germany’s Bund, called on the negotiators to, “take the proposals on regulatory cooperation off the table”. “Leaks over the past few months revealed that proposals for regulatory cooperation carry the threat of regulatory attacks and lowering of standards in the short term as well as in the long term,” they claimed in the statement, which also called for negotiating documents to be accessible to the public. Pro-TTIP groups, including the American Chamber of Commerce and BusinessEurope, said there were too many barriers preventing trade between the EU and US. Despite political assurances, and the fact EU and US regulators had long worked together on cooperative agreement in areas such as airplane safety, there was still opposition to transatlantic regulatory cooperation, they said in their statement. “By ensuring that regulators are better aware and understand what their transatlantic counterparts are doing, TTIP can help avoid and overcome unnecessary regulatory differences that often make trade prohibitively expensive – especially for SMEs – while maintaining the current high levels of protection enjoyed by US and EU citizens,” the statement said. 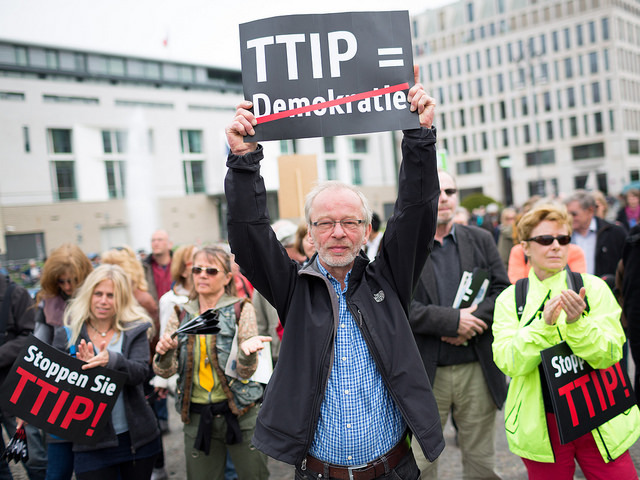 Both the EU and US are keen to make TTIP the most ambitious trade deal ever concluded. This week, diplomats and lawyers are deep in discussion about what rules can be treated as equivalent to each other, with a view to opening up markets and facilitate imports and exports. But the US is not willing to accept EU calls for regulatory cooperation in financial services. It is firmly against the EU’s attempt to work together in overseeing the US’ financial sector. It argues that, in financial services, such cooperation could weaken American rules. The EU took financial services off the table in the sixth round of talks, admitting in a note to member states that the US opposition was too strong at this stage. The decision was made so that progress could be made on other less controversial areas of regulatory cooperation to increase market access. Despite that, Stability, Financial Services and Capital Markets Union Commissioner-designate Jonathan Hill told MEPs at his confirmation hearing on 1 October that he backed financial services’ inclusion in the final agreement. If successful, the deal would cover more than 40% of global GDP and account for large shares of world trade and foreign direct investment. The EU-US trade relationship is already the biggest in the world. indeed, but this pair of knob-heads NEVER say what they are. I saw an idiot from B-E last night on Aljazeera talking about TTIP, more full of crap than an effluent treatment plant – claiming that Euro SMEs would benefit from TTIP – good to see B-E is taking a leaf out of Herman Goering’s book about big lies.